a person who engages in a pursuit, esp. a sport, on an unpaid basis. I am an amateur photographer. It is not my profession. I am not formally trained in it. I have never owned a single lens reflex camera. And I am not expert enough to describe f-stops. But I do enjoy taking photographs; the derivation of the word amateur from the Latin word for lover is fitting. I find today's point-and-shoot cameras are quite powerful and take great photos. And I prefer to strive for the perfect shot at the time I take the photo so there is no or limited need to alter the photo after it is taken. 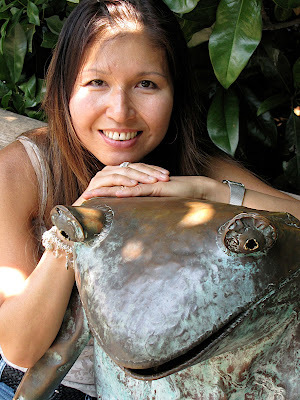 This posting shares some of my tips on taking photographs. I use photos I have taken as examples. My tips generally follow the keep it simple philosophy. While I am not opposed to the alteration of photos after they are taken with tools like Photoshop, and I do find some of these enhancements can be artistic, I personally have not taken that approach except for an occasional crop or auto enhance. The photos presented below have not been altered. TIP 1: TAKE PHOTOS, NOT SNAPSHOTS. That is, give some thought to your photo and do not snap a shot hastily. 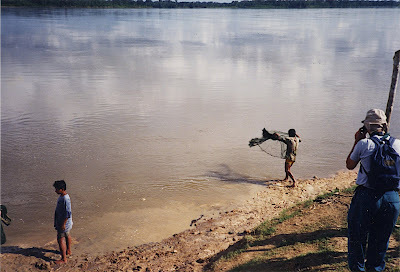 I bought my first camera in 1994 just prior to a trip I took to the Amazon in Peru. It was from this first trip that I learned the difference between the two. I have saved the following two photos to remind me of this tip. 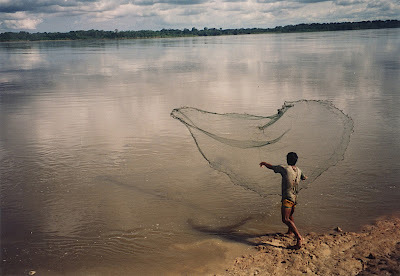 Below is the photo I took of a fisherman casting a net on the Amazon River. After coming home and sending out this photo to my tripmates, I received this photo below from a fellow traveler with a note stating she had taken the same photo as I did. My photo is focused on the fisherman. I positioned myself to be closer to him, and I zoomed in more. I waited until the net was fully cast before taking the shot. I wanted the expanse of the river so I put him in the bottom right of the frame. For me, the top one is a photo. The bottom one is a snapshot. TIP 2: HAVE THE PATIENCE TO WAIT FOR THE RIGHT SHOT. The previous example showed that good photographers must have patience and anticipate when it is the right time to take the photo. There is no question luck can also play a factor in taking good photos. I have hiked in places where I was able to take a photo of a beautiful valley. Hikers who came just a few minutes after me saw nothing but fog. But patience can often help you take better photos even in unlucky situations. This photo was taken during a cloudy hike on the Inca Trail in Peru. I saw a slight break in the clouds and waited for it to open just enough and pass by a mountain peak before I took the photo. TIP 3: GET UP EARLY IN THE MORNING TO TAKE PHOTOS. Actually, take photos whenever it is the right time. But do not forget the morning as one of the times to take photos. Here are just two of the reasons. First, you can avoid crowds and take shots without people that may distract a shot. Here is a photo I took of the World War II Memorial in Washington, D.C., USA, early in the morning. I wanted to take a photo of the memorial without people blocking the symmetry of the shot. Second, mornings can have some special qualities, just like dusk can give you beautiful sunsets. Here is a photo of the Washington Memorial in the early morning dew. TIP 4: TAKE PHOTOS OF THE SAME AREA AT DIFFERENT TIMES OF THE DAY BECAUSE DIFFERENT LIGHTING MEANS DIFFERENT PHOTOS. If you have the luxury of visiting a place multiple times, take photos each time. Do not assume you have already taken the photo. The lighting can make a difference. Here is a photo of the Washington Memorial taken later that same day. TIP 5: INCLUDE A FAMILIAR OBJECT IN PHOTOS IN WHICH YOU WANT TO EMPHASIZE SIZE OR SCALE. Here is an example of what not to do if you want to convey size. This is the seed pod of a baobab tree. While it is a nice photo and has a good composition, it does not convey the size of the seed pod. Is it larger than a plum? Smaller than a loaf of bread? You cannot tell. Here is a photo of a baobab tree that grows from that seed. Look at the man to the left of the tree. It shows that it is a very large tree. In hindsight, I should have had the guide park his jeep next to the tree to really emphasize the size of the baobab as the man is difficult to see. 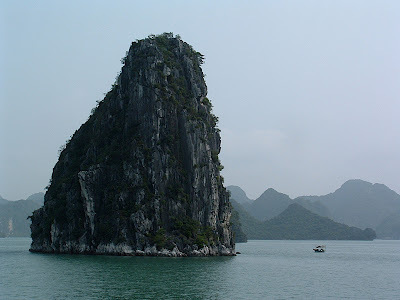 The picture of this outcropping from Halong Bay in Vietnam requires the fishing vessel to the right of it to give a sense of how tall this island is. I was fortunate the boat was there. The woman in the bottom right gives an indication of how large the red doors are. Here is another example. This termite mound is almost twice the height of the man standing next to it on the right. And here is one more example. The man on the boulder helps emphasize our small size next to this waterfall. TIP 6: USE THE MACRO SETTING ON YOUR POINT-AND-SHOOT CAMERA. The macro setting is usually marked with a flower icon. This allows you to take close-up photos of objects like flowers. Photos taken with this setting give a nice blurry and soft quality to the items in the foreground and background. These were all taken with the macro setting on a point-and-shoot camera. Some tips on using the macro setting include making sure you have put it in macro mode, making sure the camera lens is not zoomed so that it can focus correctly, and pressing the shutter button half-way to focus on the portion of the object you do want in focus. I find this is best done when people are not posing and are being their real selves. 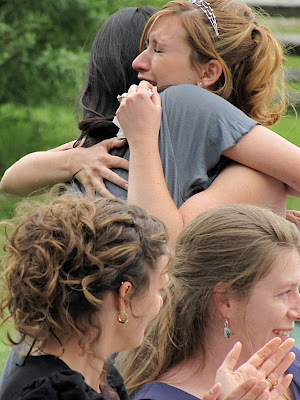 You do not know when vivid emotions are going to be expressed, so you have to be ready. And have a little luck. Weddings are wonderful opportunities to capture joy. Here are a couple of examples I have taken. I was at the right place at the right time. TIP 8: IF IT MUST BE POSED, BE CREATIVE SO THE PHOTO DOES NOT FEEL STAGED OR FORCED. One technique is to not tell the subject when you are taking the photo. Let them have fun and position themselves as they would like be. These three siblings naturally posed this way, and I took the shot immediately as they settled in before counting to three. Incorporate other objects in the photo to create a relaxed or whimsical setting. And for babies, do not wait for a perfect shot. Take it immediately when they look your way. TIP 9: TAKE ADVANTAGE OF DRAMATIC LIGHTING. Many point-and-shoot cameras do not do well in low light and the results can be grainy. Oftentimes you need a tripod or they come out blurry. Experiment with your camera and see what works. Try different settings, including the night setting. But don't avoid taking low light photos. Sometimes they come out in your favor. Here is a photo with candles. In the photo below I was trying to capture the silhouette of a baobab tree as the sun went down along with the moon up above. Unfortunately, I could not move the moon lower toward the horizon or get closer to the tree. But the lighting still works to dramatic effect. TIP 10: TAKE CLOSE-UPS, CAPTURING ONLY PART OF THE SUBJECT. In the Forbidden City in Beijing, there is a bronze male lion with a ball under its paw to signify imperial power. I took a photo of the ball and paw rather than the full lion. Part of the reason was there were too many people posing with the lion. The other part was I thought it made for a more interesting shot. TIP 11: BE ADVENTUROUS TO CAPTURE SHOTS FROM UNIQUE PERSPECTIVES. This is a picturesque photo of Machu Picchu, a very typical photo most visitors take and one that should not be missed. But if you climb the mountain in the back--Huayna Picchu--you can get a unique photo of Machu Picchu from an different vantage point. TIP 12: HAVE YOUR CAMERA AT THE READY FOR THE UNEXPECTED. I turned the corner on this hike to encounter this sheep. We both were startled. The camera was already in my hand. I snapped immediately before I came to my senses and reversed my course. I looked down over a railing into a pool at a temple in Vietnam. 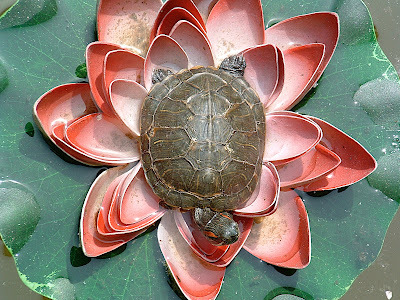 I was surprised to see a turtle down below. Actually, look all around you to find interesting views. 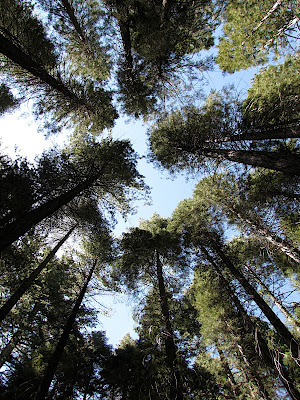 Here is a photo of giant sequoias taken by getting in a patch of these trees and aiming skyward. Tip 14: REQUEST A WINDOW SEAT AND LOOK OUT OF THE AIRPLANE WINDOW. When you take photos from airplane windows, turn your setting to landscape mode (the mountain icon) so the camera does not try to focus on the window. Also put your camera lens right next to the window so it does not pick up any reflections from the inside of the plane. I was very fortunate to take this photo as we were flying over the Andes. I had an aisle seat and a woman let me switch with her so I could look out for a few minutes. Perfect timing. Here is a sun setting into the clouds. And one final photo of volcanoes when flying into Managua, Nicaragua. 1. Try to avoid using the flash as much as possible. Especially on humans it creates distracting shadows. Use natural light, but keep the camera very steady while shooting. Manually disable the flash if shooting a far subject at night, like a city skyline. 2. The one exception to the above is when the subject is in shade with light from behind. Use the flash to fill in and light up your subject. I have a really good example of this that I'll send you. Ironic thing about most point and shoot cameras is that they will turn on the flash in situations like #1 and disable the flash in situation #2. 3. Pre-focus the camera when dealing with fast-moving subjects. Aim the camera at the spot where you expect the subject to be. Then press the shutter button halfway and hold it there. When the subject comes into view push the shutter all the way down. Many good shots are missed because the photographer didn't have the camera ready. Daniel, you probably did that when shooting the fisherman casting his net. Excellent post, Daniel! Thanks for all the great tips. I love the photo of Grace! Such great, practical advice. Thanks for sharing, Daniel. I always enjoy looking at your photos. What a wonderful post! I truly appreciate the thought you have put into this for us shutterbugs! I have already passed the link along to a few I know who enjoy looking at the world through the lens of a camera. Thank you. I will try my best to practice. What kind of camera are you using?